Fishing out of Henderson Harbor and Eastern Lake Ontario is always a great experience. Here are some snapshots of great fishing experiences aboard the Milky Way. Catch and Release Day Works out Good for Father/Son Team! On Saturday, June 9th, Glenn McKenzie (Mack) and his Dad, John, boarded the Milky Way for a fun day of catching and releasing. Lake Trout Limit for Fishing Couple! 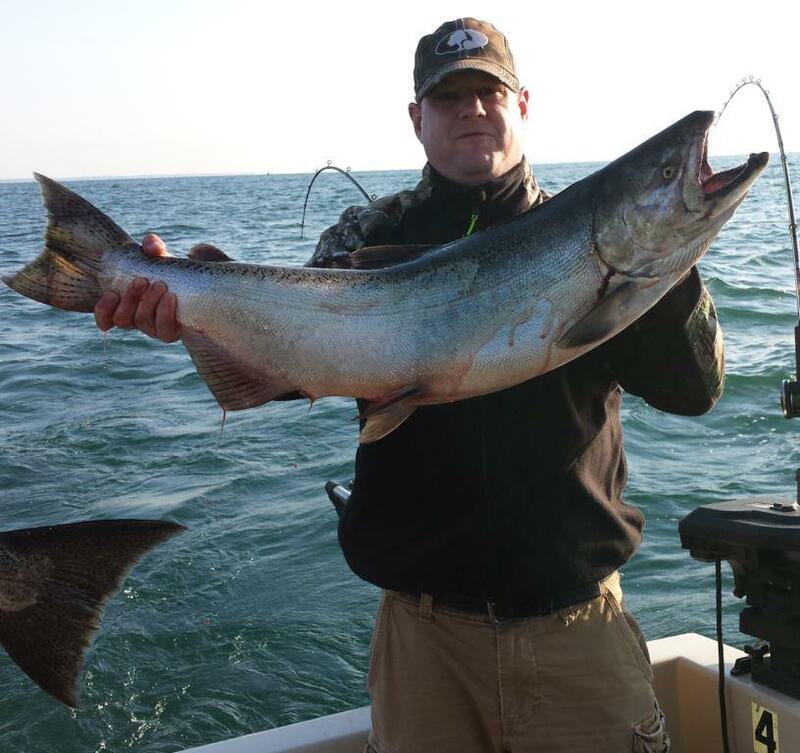 Tracey and Vince Kehrer enjoyed a great day weather-wise and fishing-wise on Lake Ontario on Wed., May 30th. The couple wanted to target Lake Trout and they made the right choice as they caught a limit of Lake Trout with most of them being big heavy fish along with a small Brown Trout. Early Season Lake Trout Limit! The May 27th fishing charter for the Patti Ulmen seemed full of surprises as the weather was predicted with rain and afternoon thunderstorms and the fishermen wanted to target Brown Trout. Great Day - Great Catch! The first charter of the season for the Milky Way turned out to be a good one for the Rick Welsh party. On Sunday, May 13th, Rick, Bob and Mike boarded the Milky Way and not only enjoyed a beautiful day out on the Lake, but they also were kept busy catching pike and pickerel. These fishermen were able to put 3 big Pike in the box along with 8 Pickerel. Foggy Day But PA Fishermen See Their Way Clear For Lake Trout Limit! On Saturday, Sept. 16th, the Brian Warholic party found themselves on Lake Ontario in pea-soup thick fog fishing in the trench. Tough Day on Water Nets a Couple Salmon! On Monday, September 11th, the Marvin Widrick party went fishing with the Milky Way. The day started off promising when a King Salmon hit the Dipsy Diver as soon as the rig was set. A Beautiful Day Out on the Lake Combines With Another Lake Trout Limit! On Sun., Sept. 10th, the Terry Applebee party consisting of Caden, Seth, Bill, Marshall and of course Terry, boarded the Milky Way for a day of fishing on the lake. Another Lake Trout Limit Aboard the Milky Way! On Sat., Sept. 9th, six fishermen and women of the Mark Peachey party worked hard to catch their limit of Lake Trout. Best Man Stands Up for 3 Kings! On Wed., Sept. 6th, John Ebblie chartered with the Milky Way to try fishing for Kings for his first time! Wet Day Does Not Dampen the Spirit of These Lewis County Boys! On Sun., Sept. 3rd, in spite of a wet, rainy day , the boys from Lewis County, with the Ben Pate charter, still had an enjoyable day of fishing!